This Nvidia 7600GS AGP Card works right out of the box. The card has a dongle for HDTV compatability (not tested). The card had no issues supporting UI2 alphablending. 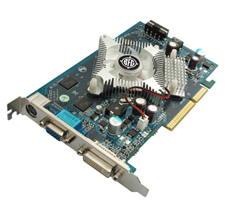 The Nvidia 7600GT, PCI-E card does not work with the DVD install, connecting the cable to the DVI output on your PC. You must install Kubuntu first, then CD1 + CD2, and then it works. This page was last modified on 28 September 2010, at 16:29.